In April 1922, we find Einstein lecturing in Paris, engaged in reestablishing ties among scientists in former enemy nations. Meanwhile, back in Berlin, political tensions are rising. In June, the brutal murder of his friend, Germany's foreign minister, Walther Rathenau, heavily affects Einstein who, for a while, fears for his own safety and briefly contemplates leaving Berlin and abandoning academic life altogether. When only a few months later it is announced that he will be awarded the Nobel Prize, after more than a decade of nominations, Einstein is on a steamer heading from Europe to Japan. As we learn in this volume, although he knew in advance of the coming prize, he nevertheless embarked on his longest voyage yet. His travel diary, published here for the first time, recounts in poetic prose the hectic schedule on land, the contemplative rest at sea, and his musings on science, philosophy, and art during his first encounter with the Far East, Palestine, and Spain. 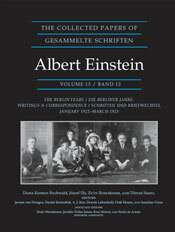 Einstein's work and intense scientific exchanges--with N. Bohr, P. Ehrenfest, A. Sommerfeld, M. Born, and others--during these fifteen months result in remarkable publications and intellectual developments. A paper written with Ehrenfest shows with uncompromising clarity that the outcome of the recent Stern-Gerlach experiment could not be explained by either classical or quantum theory. In a similar vein, he analyzes the phenomenon of superconductivity. Clearly among the leading quantum theorists, he focuses on its conceptual bases, tirelessly proposing crucial experiments that could decide between classical and quantum physics. We also see foundational interests develop in his concerns with a unified field theory of electromagnetism and gravitation.